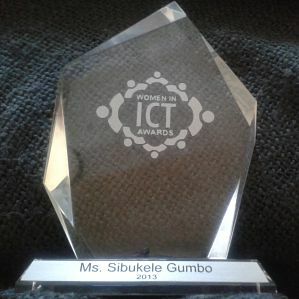 Home » Congratulations to Ms Sibukele Gumbo, the Siyakhula Living Lab Project Lead, for winning one of the 2013 Eastern Cape Women in ICT Awards! Congratulations to Ms Sibukele Gumbo, the Siyakhula Living Lab Project Lead, for winning one of the 2013 Eastern Cape Women in ICT Awards! The awards recognize achievers in the ICT field who operate in the Eastern Cape, and was a well deserved accolade for Sibukele, for the work that she does for the Siyakhula Living Lab, with the highest professionalism but also with imagination, dedication and pragmatism. Over the years, her role has been key to the life of the SLL, while contributing to the scholarly knowledge onLiving Labs, through academic papers presented at national and international conferences. The awards were handed over by the Deputy Minister of Communications, Ms Stella Ndabeni –Abrahams, at a glittery breakfast in East London on July 9th. As it happens, Sibukele was in Mozambique for that week, as a lecturer in the 3rd Summer School of ICTs, organized by the Maputo Living Lab, on server-side service development. The award was received on her behalf by Ncedisa Ncapai, Director of the Amahlumela Foundation.